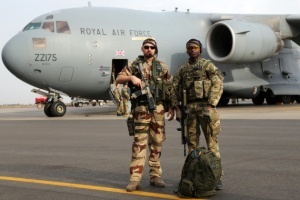 UK operations in support of the French military in Mali are continuing from Evreux Air Base near Paris. Since the short notice commencement of Operation Newcombe, C-17 Globemaster aircraft operated by the RAF�s 99 Squadron have been flying 5,000-mile round-trip missions on a near daily basis, transporting armoured vehicles, freight and personnel. Two days after the announcement by the Prime Minister that the UK would provide logistical support to French military operations in the West African state, 50 tons of military equipment were delivered to the capital Bamako, equivalent to a week�s worth of freight delivered to Afghanistan. And with unfamiliar vehicles and equipment to transport, another RAF Brize Norton-based unit has been deployed to assist. The agreement, known as the Directive of Objectives, is a direct result of the Security and Defence Cooperation Treaty signed in November 2010 by the governments of the UK and the French Republic.